As most of you know, it is entirely possible to take a virtual tour of the great vineyards of France and California without ever leaving your home. Just as it’s entirely possible to play golf at Pebble Beach and Torry Pines without ever actually stepping foot on either course. And as most of you well know, it is possible to have a thousand ‘friends’ without ever actually seeing or speaking them. I recently took a tour of the home of an old high school friend who lives in South Carolina using Google Maps. And yet as accessible and convenient as this virtual reality is, it’s not really real. You may have taken the tour but you never actually tasted the wine or swung a club or visited an old friend. A lot of people do religion as virtual reality. They’ve seen it and maybe even been there, but they’ve never actually experienced the relief of hearing “I forgive you all of your sins” spoken to them; or the peace of knowing that they are loved by their Creator; or the satisfaction and joy of being a part of the body of Christ and the communion of saints. Last Sunday, we heard Jesus call Peter and Andrew, James and John from their fishing boats saying, “follow me.” And we watched as they “immediately left their nets and followed him.” (Mat.4:18-22). They didn’t know where He was leading them or what was in store for them – they just followed Him. And as they followed Him they were changed. They learned to love Him with a love that was born out of the His love for them – something they would have never known if they had not followed Him. •	You see the world in which you live through Jesus and it changes the way you think about the news you watch and the politics of the day. •	You see your neighbors, your spouse, your children, your parents, your co-workers, your classmates, your friends and even your enemies, through Jesus, and it changes the way you think about them and the way you treat them and they way you respond to the ways that they treat you. •	And you see yourself through Jesus and it changes the way you think about yourself as a human being and where your real security lies and what your real purpose is. Just to be sure we get this right, you don’t change your life SO THAT you may follow Jesus. A lot of people are trying to get their life together and when they do, they’ll follow Jesus. It doesn’t work that way. His call to “follow me” never comes with qualifications that we must first meet before we’re fit to follow Him. As Paul impresses upon the Romans, He calls us to follow Him, “while we are still weak,” “while we are still sinners,” “while we are still enemies,” “while we are still dead” in our sins. It’s in the following, that He transforms us into saints, righteous and holy in His sight, alive with a new life that is the very life of Jesus Christ Himself living in us. The “sermon on the mount” maps out the journey for all who will FOLLOW HIM. The Lord tells His followers in advance the changes that discipleship will make in their lives. The first four describe the changes in your personal relationship with God you should expect to see in yourself. Following Jesus will make you “poor in spirit” before God; “mournful” before God; “meek” before God; and “hungry and thirsty for righteousness” before God. And then there are five changes that you should expect to see in your relationship with your neighbor. Following Jesus will make you “merciful” toward your neighbor; “pure in heart” toward your neighbor; “a peacemaker” with your neighbor. And if they should “persecute you” just because you’re acting like a Christian, you will “rejoice and be glad” that you have the blessed privilege of membership in the cosmic fellowship of all who have been persecuted for the name of Jesus. So, what is it about following Jesus that changes a person like this? What is it about following Jesus, who alone, that changes a person like this? In a word, it is the gospel – the love of God poured out to sinners for no other reason than God is love and He loves the world and He loves you. And it’s unconditional. Whether you follow Him or not, whether you love Him or not – He loves you – for no other reason than He is love and He loves to love and He loves you because He made you and you belong to Him. Jesus Christ is the love of God incarnate and dwelling among us. God is not into ‘virtual reality.’ He’s into real life, flesh and blood, FOLLOW ME, reality. In Him, we experience the love of God given to you to eat and poured out for you to drink. In Jesus Christ, we see the love of God for ALL PEOPLE, BUT THAT ONLY ACTUALLY EFFECTS THOSE WHO FOLLOW HIM. I’m being so careful to put it like this because I want to be careful to deliver this to you the way Jesus delivered it to His disciples and the crowd listening in. There are no ‘if’s’ in any of these statements that make them ‘conditional’ – “if you change to be like this, then you will be blessed.” Don’t ever read the beatitudes as nine new commandments piled on top of the previous 10. We do not follow Jesus so that HE MIGHT CHANGE and learn to love us. 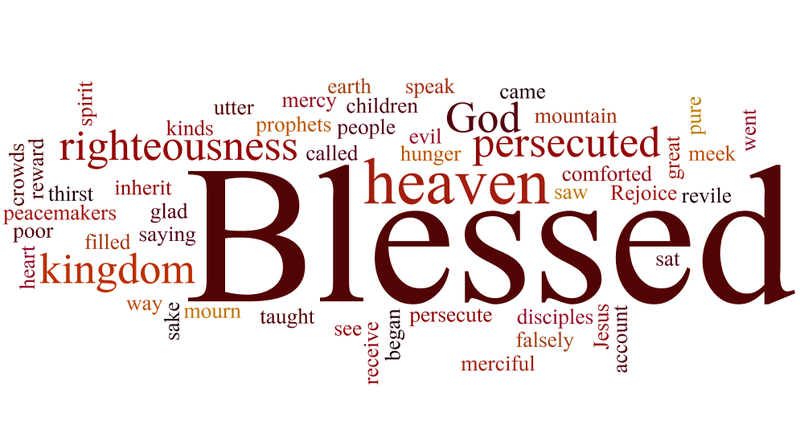 Each beatitude BEGINS with the announcement of BLESSING IN THE PRESENT TENSE. “Blessed are you…” That’s the first that the followers of Jesus hear as the journey begins. It comes long before the change that His word effects in those who follow Him. •	You used to act like a “rich man” before God who didn’t need what He was selling. But now, in following Him, you’ve changed and you’re a beggar before God, “poor in spirit,” and thankful for whatever morsels of life might fall from His table into your hands and your mouth. •	You were proud as a peacock with yourself before God, and used to swear that you had no regrets and weren’t sorry for anything that you’ve done or left undone. But now you “mourn” your sinful life and you’re ashamed of yourself for being so self-centered. •	You used to think that you could satisfy your appetite by getting just a little more of whatever promised to satisfy you. But now, in following Jesus, you know how starved you are you and you “hunger and thirst for the righteousness” that only He can give. Your changed attitude toward God has also changed you’re your attitude toward your neighbor. •	You used to insist on ‘fairness’ and ‘justice’ and an eye for an eye and a tooth for a tooth. But now, in following Jesus, you strive to be “merciful” as God has shown mercy to you. •	You used to be filled with impure motives and deceitful with your neighbor, calculating what you might gain from him. But now, in following Jesus, you’ve changed and you treat your neighbor with a “pure in heart” that has been purified by the blood of Jesus, shed for you. •	You used to enjoy a good fight and didn’t mind stirring things up with a little gossip or false accusation. But now, in following Jesus, you’ve changed and you’re a “peacemaker” just as God has made peace with you through His Son, your Lord. •	And when all of your good intentions and sincere efforts to be ‘a good Christian’ were spit right back in your face, you used to say, ‘well if that’s what this gets me, who needs it.’ But now, as you have followed Jesus, you’ve changed. Now you “rejoice and are glad” to be counted worthy of the honor of being rejected and even suffering and dying with your Lord and the blessed martyrs of every age. Put all of this together and you get a picture of the follower of Jesus and how discipleship has changed him. The change that Jesus works in His followers is always a ‘work in progress’ as long we are still in this world, where we are daily tempted to take our eyes off of Him and revert to our old ways. The complete metamorphose from sinner to saint, from old man to new man, doesn’t come until, as Paul writes to the followers of Jesus, “the final trumpet sounds, and the dead will be raised imperishable, and we shall be changed.” (1 Cor. 15:52).